Our kohlrabi was so big and juicy that we not only doubled the eggs, but also tripled the flour. We also had some fantastically aromatic dill that I chopped and added to the kohlrabi mixture. 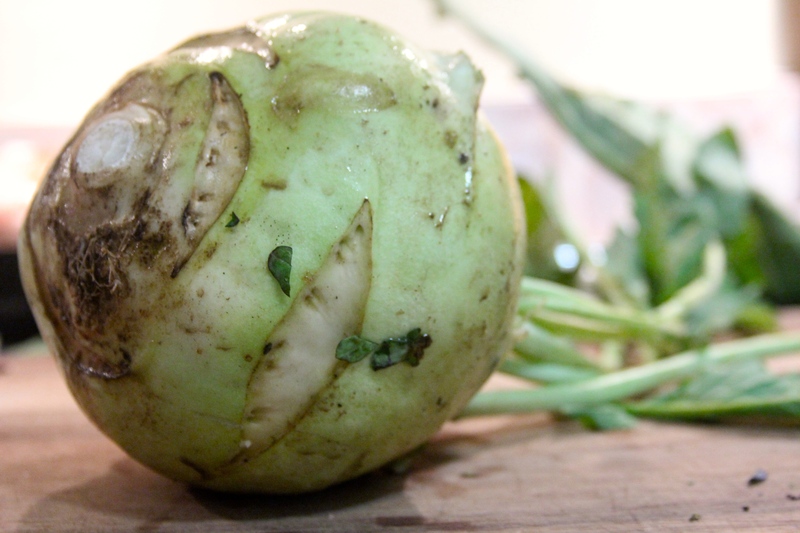 Peel the kohlrabi or chop the skins off with a knife. 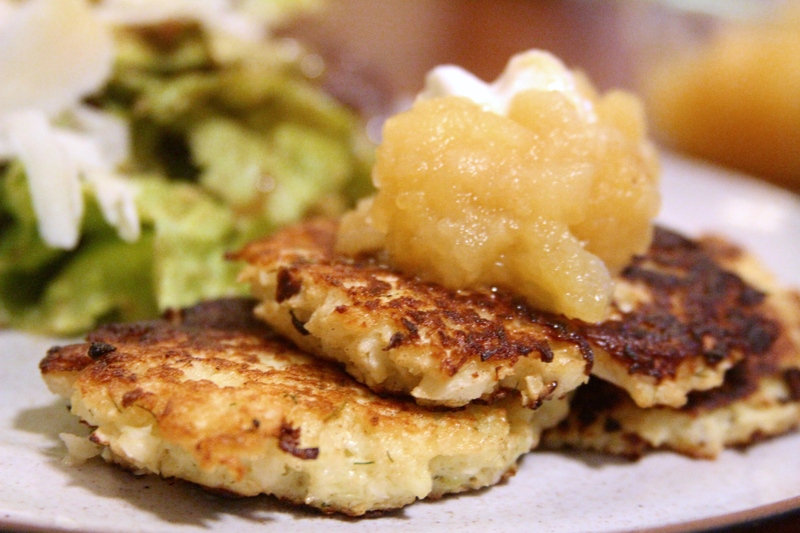 Grate the kohlrabi on a large holes of a grater or shred it in a food processor. Put the grated kohlrabi onto some towels, twist them together, and squeeze out as much liquid as you can. Crack the egg (or eggs if you’re doubling) into a large bowl and beat it with a fork. Combine the kohlrabi and the egg and chopped dill. Sprinkle the mixture with the flour and salt and stir to combine thoroughly. Heat a generous layer of oil (about 1/4 inch deep) in a large frying pan or pot over medium-high heat until the pan is evenly very hot. A bit of batter dropped into the pan should sizzle immediately. Put generous spoonfuls of batter into the pan and flatten a bit with the back of the spoon. 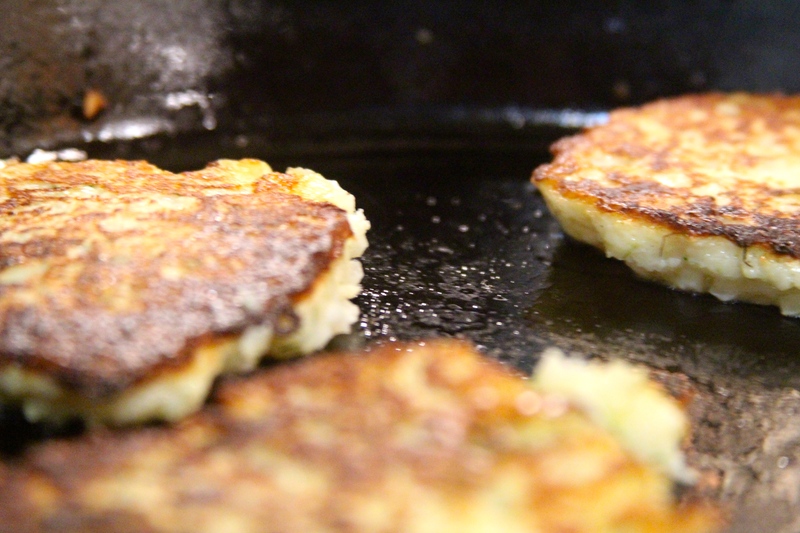 You should be able to fit about four fritters in a large pan at a time. 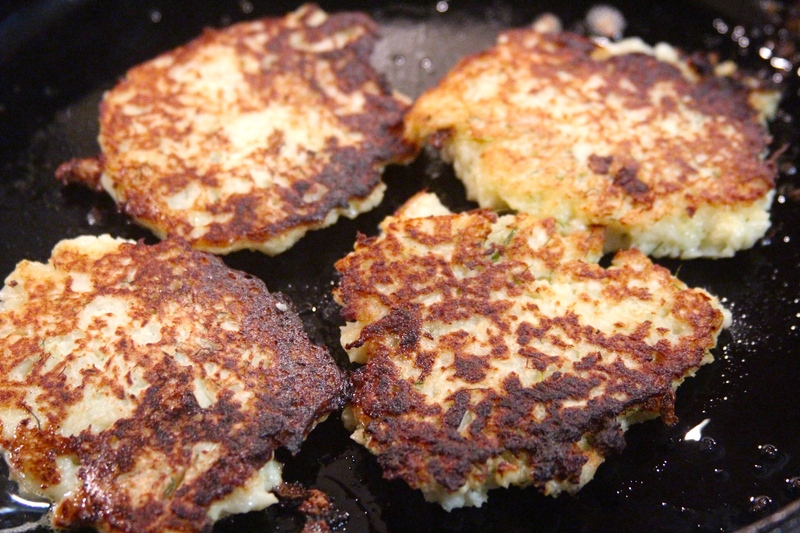 Partially cover and cook until the fritters are browned on one side, 2 to 3 minutes, flip, partially cover again, and cook until they are tender and browned on both sides. 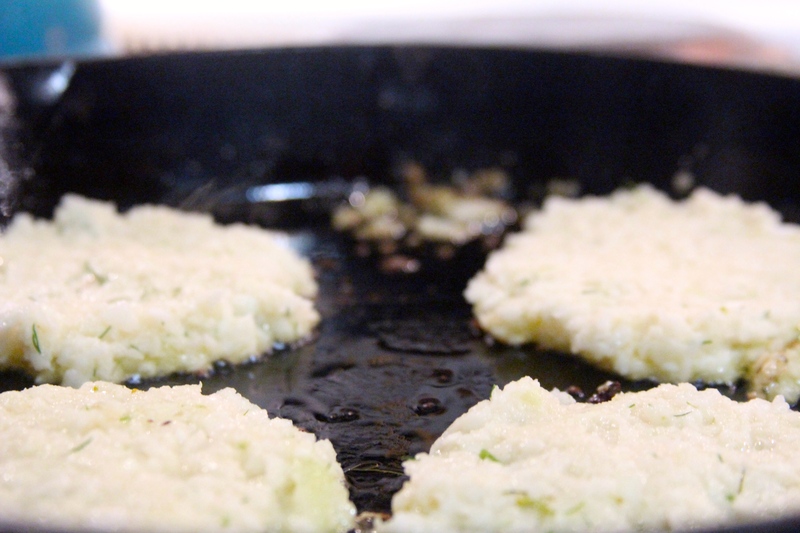 Transfer the fritters to a paper towel-lined plate to drain. Repeat with remaining batter. Serve immediately. W hile the fritters were frying I chopped up some of our CSA apples and put them in a pot, covered them with water, and let them cook down into applesauce. It’s bonkers to buy applesauce when it is this simple to make. And your local apple flavor will be massively more delicious than Mott’s, I promise! We also squeezed half a lemon on some Greek yogurt and added a swizzle of honey. 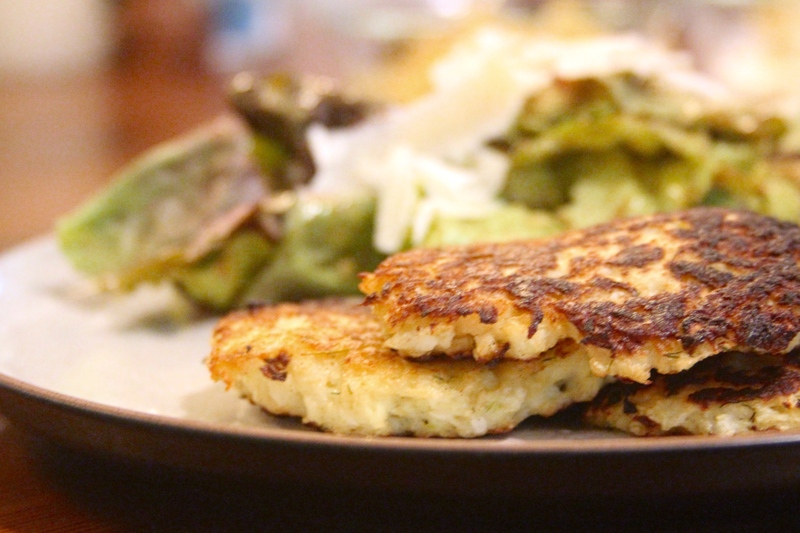 Dinner: Kohlrabi Fritters with Applesauce and Lemon-Honey Yogurt and a nice big share salad.